I’ve always worked figuratively. However since I started creating patterns I’ve been having a ball with abstraction and work that’s more focused on lines, shapes, and texture. 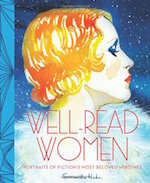 I recently updated my site with little tweaks and noticed a lot of work without the figure. So I compiled a little collection to show you. 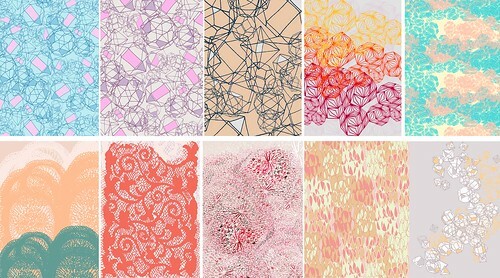 I would love to make these into journals, cards, or perhaps even bedding?? I’m still in love with the figure and will always work with it, but it’s nice working differently sometimes too. Hope you are all enjoying the weather where you are. Here in Brooklyn it’s like a tropical rain forest minus the beautiful nature! On a different note, look at these tasty goodies Dave brought home for us the other night. 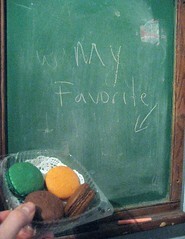 The mint/chocolate macaron looks nice with my green blackboard don’t you think? 4 Responses to lines, colors, shapes, + textures sans figure. Thank you so much Wendren!!! I’m so thrilled to be on that blog. I love it. btw, I have the sachet on my desk. I love the smell of lavender! Lovely, lovely!! I would love to see many of those as bedspreads or fabric on chairs. Just gorgeous!! Oh thank you so much Andi!! !